Pork used to make me pull a face, six years ago I didn't like the stuff. Memories of dry,chewy meat made me a chicken girl any day of the week and then I tried real pork, real rare breed pork to be precise, and it was nothing short of amazing. That was a Large Black pig - free range and reared in a small herd, served up with crackling that crunched and meat that put a smile on your face. I blame that rare breed pork for a lot of headaches, long days, early starts and lots of Welly stealing mud, but I am so glad I tried it because it changed everything! A few months later it started, back then I was a TV reporter during working hours and a pig farmer every other minute of the day. We called our small holding Muddy Lovely and I realise now how little we knew! For starters I had no idea of three essential things, pigs are escape artists, pigs are fast and pigs are strong. Within the hour I knew all of this and was out of breath, near to tears, running around a field after my first three Large Black piglets. I still love those three strong anglers who took pity on us, put down their rods and helped catch and carry the piglets back to their run. 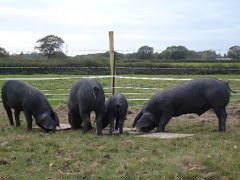 Fast forward to 2015 and a lot has changed, I am a mean pig carrier for one thing and I can talk pork for hours, anything from how the different rare breeds taste to how you butcher them. It's Middle Whites and Berkshires in the fields now, the Large Black is amazing but I cannot go without slow cooked belly pork from a Middle White or Berkshire ever again! 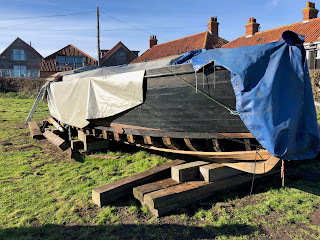 There's one huge, enormous and slightly terrifying change,our location.we left a long list of lovely and loyal customers behind in Sussex to move to a bigger smallholding near Swaffham in Norfolk. Benefits come with the terror of starting from scratch, we may not have a waiting list any more but we have good land, the pigs cannot turn it to a bog and trust me that is one huge benefit, and the mud in Sussex separated me from a lot of Wellies over the years. We have room, lots of room! Enough for other animals; our herd of both Jacob and Wiltshire Horn sheep is growing and there's a small flock of Norfolk Black turkeys that's recently taken residence. One thing has not changed and never will, we are not in this for the money, we are in it for the meat! I am my most loyal customer and I am no doubt biased but seriously other pork does not come close. We are still part time farmers but that means we can keep this as we want it, free range and small herds of rare and heritage breeds reared slowly just as nature intended. Because of that we have limited availability, Middle White bacon, gammon and sausages will be available in October and also Berkshire pork at the same time. Do place an order now. Oh and I am happy to race you for your belly pork but be warned, pig chasing has made me fast! Members of Slow Food Anglia and Slow Food Norwich are looking forward to visiting Danielles smallholding very soon and we will write about our visit along with some photos in our regular Blog pieces and this piece and our visit will also be included in our Monthly newsletter.